Russian technical specialists have completed the reconfiguration of S-300PM/PM-2 air defense systems to the export version S-300PMU-2 Favorit in Syria and returned to Russia, a military-diplomatic source said on Wednesday, November 7, according to TASS. "Technical specialists from Russia’s defense industry enterprises who arrived in Syria in early October following the supply of S-300PM/PM-2 systems have completed their reconfiguration to the export version S-300PMU-2. They returned to Russia several days ago," the source said. "All three battalions armed with S-300PMU-2 systems are ready for combat operation in Syria. Syrian military personnel is now to be instructed in their use," he added. Another military-diplomatic source earlier said that Russia’s technical specialists were to replace Russian codes and letter frequencies of the ground radar interrogator and letter codes of radars to Syrian ones. 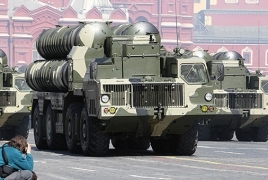 On October 31, Russian Defense Ministry spokesman Igor Konashenkov said that alongside the S-300 air defense systems Russia provided sets of the automated system of air defense means control Polyana D-4, which ensures effective control of combat operations by a missile air defense brigade or a mixed air defense group of air defense missile systems S-300 and Tor, air defense systems Buk, and air defense missile and artillery systems Pantsir-S and Tunguska. The agreement on providing S-300 systems to Syria was signed back in 2010 only to be frozen shortly afterwards. On September 24, 2018 after the loss of Russia’s Ilyushin-20 reconnaissance plane in Syria Russian Defense Minister Sergey Shoigu said that Russia would provide S-300 systems to reinforce the Syrian army’s combat capabilities. On October 2, 2018 Shoigu reported to President Vladimir Putin that the S-300 systems had been airlifted to Syria and that Syrian military personnel would take three months to be instructed in using them in combat.